Deir ez-Zor (Arabic: دير الزور‎ Dayr az-Zūr; Syriac: ܕܝܪܐ ܙܥܘܪܬܐ Dayrāʾ Zəʿōrtāʾ) is the largest city in eastern Syria and the seventh largest in the country. Located 450 km (280 mi) to the northeast of the capital Damascus on the banks of the Euphrates River, Deir ez-Zor is the capital of the Deir ez-Zor Governorate. In the 2004 census, it had a population of 211,857 people. Among Syrians and neighbouring regions, Ad-Deir is used for short to indicate Deir ez Zor. In Syriac, Zeʿūrta (ܙܥܘܪܬܐ) means "little"; hence, Dīrā Zeʿūrta means "small habitation". The current name, which has been extended to the surrounding region, indicates an ancient site for one of the Early Christian secluded monasteries spread since the persecution times and Apostolic Age throughout Mesopotamia. Although Deir (ܕܝܪܐ), which is Arabic for "monastery", was thought to be kept throughout Medieval and Modern Age renaming, Zor, which indicates the riverbank bush, appeared only in some late Ottoman records. Many different Romanizations are used, including Deir Ezzor, Deir Al-Zor, Deir-al-Zour, Dayr Al-Zawr, Der Ezzor, Deir Azzor and Deirazzor. Deir ez-Zor is situated 85 km (53 mi) to the northwest of the archaeological remains of Dura-Europos and 120 km (75 mi) northwest of the remains of the ancient city of Mari. During Roman times it was an important trading post between the Roman Empire and India. Conquered by Zenobia, it became part of the kingdom of Palmyra. After a successive wave of conquests, it was finally destroyed by the Mongols as they swept across the Middle East. The modern town was expanded by the Ottoman Empire in 1867 around the pre-existing town. In 1915, the city became a major destination point for Armenians subjected to death marches during the Armenian Genocide. A memorial commemorating the events was erected in the city in 1991. France occupied Deir ez-Zor in 1921 and made it the seat of a large garrison. Meanwhile, the region was locally ruled by Fadel Al-Aboud, a member of an aristocratic family. In 1941 British-led forces defeated the Vichy French during the Syria-Lebanon campaign, which included a battle over Deir, and they handed administration of the region to the Free French. 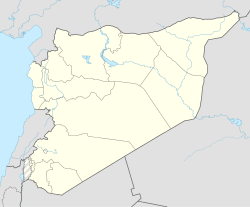 In 1946 it became part of the independent Republic of Syria. On June 19, 1947, the Syrian Army took the survivors of Pan Am Flight 121 to the Presbyterian mission hospital at Deir ez-Zor. During the Syrian civil war, armed military clashes erupted in the city between the Syrian Armed Forces and the Free Syrian Army (associated with the National Coalition for Syrian Revolutionary and Opposition Forces) and other opposition organizations such as Islamic State of Iraq and the Levant and Jabhat Al-Nusra. On 21 September 2014, the Armenian memorial complex was blown up by militants of the Islamic State of Iraq and the Levant, who had formerly been part of al-Nusra Front. Deir Ez Zor district for more than two years remained one of the few Syrian Government′s strongholds in eastern Syria. In May 2015, Islamic State militants launched an offensive, capturing Palmyra and cutting off the remaining supply line to Deir ez-Zor. The city was then effectively under siege by ISIS, leaving supplies to be solely delivered by transport helicopters. ISIS attempted to stop the supplies by daily attacking the Deir ez-Zor Airbase. However, their attempts failed due to the presence of elite Republican Guards of the 104th Airborne Brigade led by Brigadier General Issam Zahreddine. In early September 2017, the SAA forces moving from al-Sukhnah, reached the stronghold and joined the besieged garrison. Shortly thereafter, the siege of the city as well as the siege of the city′s airport were lifted. By 3 November 2017, the SAA had fully liberated the city. Köppen-Geiger climate classification system classifies it as hot desert (BWh). The city and its rural surrounding is a fertile and prosperous farming area, with livestock-breeding (for awassi sheep), cereals and cotton crops. Many agribusiness institutions work there as well. Since the discovery of light crude petroleum in the Syrian desert it has become a centre for the country's petroleum extraction industry. It is also a minor centre for tourism with many tourist facilities such as traditional French-style riverbank restaurants, up to 5-star hotels, a hub for trans-desert travel and an airport (IATA code: DEZ) in Al-Jafra suburb. There are salt mines nearby. The majority of Deiries (from Deir ez-Zor) are Arab Muslims, with few Armenian and Assyrian/Syriac families. Deir ez-Zor was the final concentration place for Deir ez-Zor Camps for annihilating the Armenian deportation caravans. Tens of thousands of surviving men, women and children were systematically killed on the banks of the Euphrates River. The Armenian Genocide Memorial church commemorated the memory of Genocide victims who lost their lives, but it was destroyed on 21 September 2014 by Islamic State militants. Successive waves of new settlers from surrounding countrysides and provinces were heavily related to severe drought in late 1950s and 1990s most of them looking for standard jobs and giving up their farming and herding lifestyle. The Mesopotamian variety of Arabic is used in the city; a slight influence of the Aleppo dialect can be noticed as well. Dominated by Sunni Muslims, Christianity in Deir ez-Zor can be traced back to the Apostolic Age, with few active churches and chapels belong to different congregations. 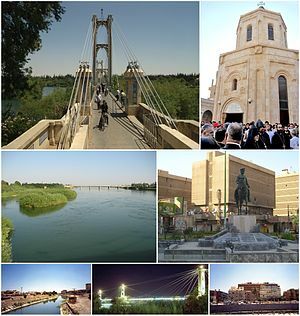 The city was also famous for the Deir ez-Zor suspension bridge (Arabic: الجسر المعلق‎) which spanned the Euphrates and was destroyed in 2013 during the civil war. The Deir ez-Zor Museum keeps thousands of antiquities collected from nearby archaeological sites in Northern Mesopotamia. Main campuses of Al-Furat University and Aljazeera University are also located there. Many other polytechnic schools and professional institutes provide tertiary education are based in the city as well. The local daily newspaper Al Furat and few other publications are published there and circulated in neighbouring Al-Hasakah and Raqqa governorates. Deir ez-Zor is home to the third Armenian diplomatic mission in Syria; the Honorary Consulate of Armenia, opened on 11 February 2010. Deir ez-Zor Airport is an under-developed domestic and international terminal and important hub mostly connecting with Damascus and destinations in the Persian Gulf region. Armavir, Armenia since October 2010.
Notable people from Deir ez-Zor, The historical leader Fadel Al-Aboud, military commanders Jassem Alwan and Ramadan al-Shallash, politicians Riyad Farid Hijab, Ahmad Tu'mah and Riad Darar, footballers Omar Al Somah and Oday Al-Jafal, and designer Rami Al Ali. ^ "Deir ez-Zor city population". Archived from the original on 2012-07-31. ^ a b "Syrian Ministry of Tourism (in Arabic)". Retrieved 10 May 2007. ^ "Monument and Memorial Complex at Der Zor, Syria". ^ "Who destroyed the Armenian Genocide Martyrs' Memorial Church in Deir Ezzor?". conflict antiquities. 12 November 2014. Retrieved 20 March 2015. ^ a b c Chris Tomson (12 December 2015). "100,000 Civilians under ISIS Siege in Eastern Syria". Al-Masdar News. Retrieved 12 December 2015. ^ Syrian army breaks Isis' three-year-long siege of Deir Ezzor: Liberating the city will mean relief for its 70,000 residents as Isis, feeling the pressure, begins to conscript female fighters The Independent, 5 September 2017. ^ Syrian Army breaks ISIS’ siege on Deir Ezzor Airport and Hrabesh and Tahtouh neighborhoods SANA, 9 September 2017. ^ Isil facing endgame after fall of last city in its caliphate The Telegraph, 3 November 2017. ^ "Klimatafel von Deir Ezzor / Syrien" (PDF). Baseline climate means (1961-1990) from stations all over the world (in German). Deutscher Wetterdienst. Retrieved April 26, 2017. ^ "Deir Ezzor Climate Normals 1961–1990". National Oceanic and Atmospheric Administration. Retrieved April 26, 2017. ^ Al Jazeera University. Jude.edu.sy. Retrieved on 29 October 2013. Wikimedia Commons has media related to Dayr az-Zawr.